From the Mediterranean to the Swiss Alps, sunny Florida to cool Canada, Suntory’s Sun Parasol mandevillas are captivating gardeners all over the world and have become the most fashionable plant for patios, balconies, and hanging baskets. In Europe, Sun Parasol is replacing balcony-style geraniums and petunias and transforming northern towns into tropical paradises. 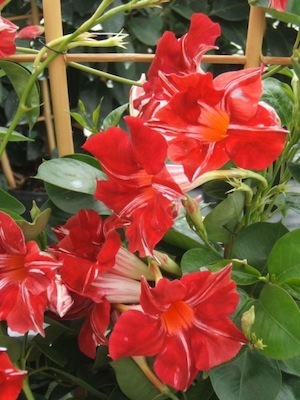 Mandevilla is now a major plant category thanks to revolutionary Sun Parasols that demonstrate superior performance and offer the widest range in colors and forms, including the first true reds. Suntory’s breeding program is unmatched. 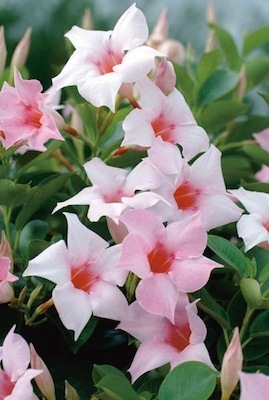 Thousands of mandevilla hybrids are evaluated each year to find that perfect new introduction. Suntory’s breeding adventure in mandevilla began with Ryuichi Tachibana and Tomoya Misato. After seeing striking colors, forms, and performance in the wild, Tachibana was determined to commercialize them to share their beauty. Misato even risked his life when he was robbed in the wilderness searching for native species. He was so taken by their beauty, he never noticed a robber approaching him with a gun at his back! Sun Parasol Original Group – These are the plants that started it all with breakthrough varieties in Crimson, Pink, Cream Pink, Dark Red, White, Burgundy and the novel Stars & Stripes, with a distinct white stripe through the center of each of the five scarlet red petals. Plants have good branching and neat foliage and produce 2- to 3-inch flowers. Use these full, bushy vining plants in patio pots, hanging baskets, window boxes or as bedding plants. See how using Sun Parasol mandevillas in beautiful containers can wake up an entrance. Sun Parasol Giant Group – The Giant varieties are classic mandevillas with large leaves and large flowers that span up to 5 inches. Compared to traditional mandevillas, plants are more disease resistant and come in a wider color range – White, Pink, Crimson, Carmine King, and Red Emperor. They have a vigorous growing habit, coarse foliage and are natural climbers. The Giants are stunning trained to a trellis or obelisk in patio pots and the most heat tolerant. Sun Parasol Pretty Group – Available in Pink and the highly sought after Crimson, the Pretty types offer superior branching and vigorous growth, producing the highest flower count per plant. Pretty hybrids combine the best of mandevillas and dipladenias and have glossy, thin, vining foliage. Plants are more cold tolerant than other dipladenias. Two new colors are Pretty Deep Pink and Pretty Deep Red, which won Favorite New Flowering Plant at the Tropical Plant Industry Exhibition in 2013. Sun Parasol Garden Crimson – Garden Crimson is the first introduction in a whole new category of mandevillas for landscapes! These plants bloom early, are naturally compact, and can be planted in masses like petunias. No trellises required. Garden Crimson is an excellent choice for window boxes, hanging baskets and patio containers. 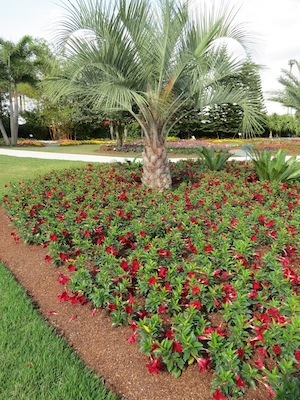 See how easy it is to plant a beautiful bed with Sun Parasol Crimson. Sun Parasol plants are natural climbers, so these new hybrids work well for trellises and arbors too. For best results, choose hybrids from the Original, Giant, or Pretty groups. • Allow 1 plant per 8-in. pot with a trellis up to 24 inches tall (3 plants in a 24-in. planter box). Use well-draining potting soil, and place pots in a sunny spot in your garden. • Apply growing media and slow-release fertilizer. • Pinch back plants to encourage new growth. As new shoots appear, train them around the trellis; continue until you get desired height and canopy. • Do one final pinch; this encourages blooming, which should start 4 to 5 weeks later. Sun Parasol® plants typically bloom mid-April to mid-October. • Keep new growth in check as needed—Sun Parasol plants can grow up to 8 inches per week.